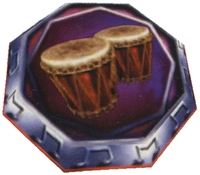 A Music Pad for DK's bongos. Triggers an event in a stage if the right instrument is used on the Music Pad. Music Pads are a type of pad in Donkey Kong 64. The purpose of the Music Pads is to have an instrument played on them, which causes an event to occur in a stage. Every Music Pad depicts one of the five Kongs' instruments, and only the pictured instrument can be used on it. The types of Music Pads are as following: Bongo (Donkey Kong), Electric Guitar (Diddy Kong), Trombone (Lanky Kong), Saxophone (Tiny Kong), and Triangle (Chunky Kong). When the corresponding instrument is played on the pad, it triggers an event to help the Kongs. The only stage that Music Pads are absent from is Jungle Japes, which means they debut in Angry Aztec. This page was last edited on November 30, 2018, at 01:41.